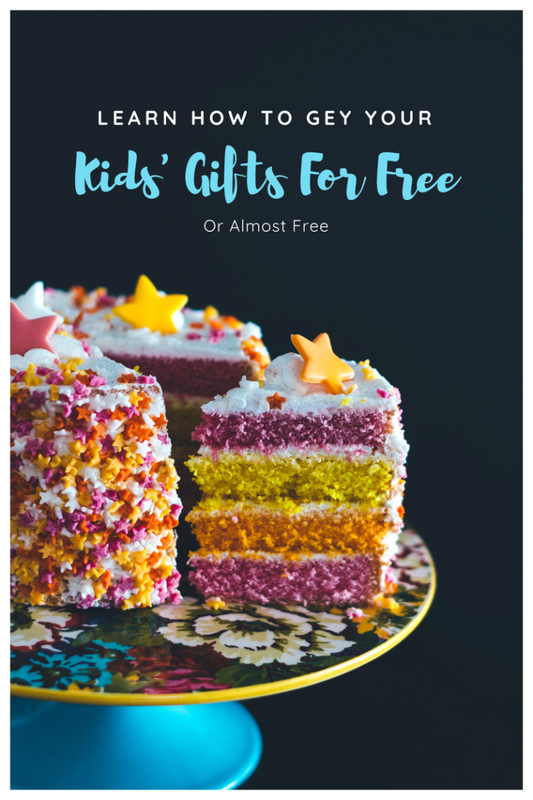 You will never believe these simple tricks to get your kid’s Christmas gifts for free and help keep clutter out of your house. I posted on Instagram stories a little trick I use to get birthday and Christmas gifts for my kids for free (or next to nothing), and so many of you messaged me saying that you loved the idea, and how did you not think of that sooner. So I thought I would share these little tricks with you. Oh, and if you’re not already, go follow me over on Instagram for more helpful tidbits! We try to stick to our budget and even budget out for Christmas and birthdays, but if I didn’t have to spend any money on these things, then why would I want to? The first thing we do is we set aside $50 a month into a Christmas/Birthday account, so that way these events don’t sneak up on us. Which is kind of funny to me because, hello, Christmas and birthdays are the same day every year! It’s a lot less painful to save a little bit here and there than to shell out $600 at one time. Or worse, put it on the credit card and pay a lot more for it later. Please don’t do that. This post contains affiliate links which help support A Blossoming Life at no extra cost to you. We only recommend products we personally use or would use. 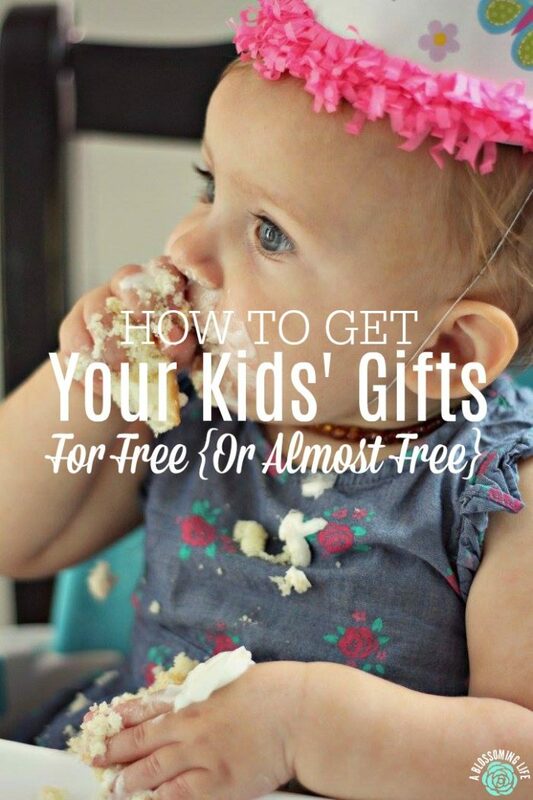 How do we get Christmas and birthday gifts for our kids for free? I like to think I’m pretty clever, but I can’t claim all of these good ideas; a friend of mine told me one of these years ago, and my husband has been the king of good deals for awhile now. Part of this little secret makes me feel slightly guilty. We are really picky about toys – what they are made of, what we allow into our house – we don’t just want a bunch of random, junky toys. 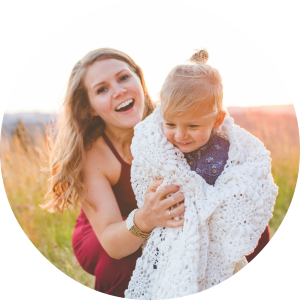 Go check out this post about how getting rid of most my kids toys saved my sanity. We like the toys to be educational (like these Melissa and Doug toys that we love) or crafts, and usually we opt for Green Toys or wooden toys. Also, we try to stay away from toys that make noise, because I’m a super mean mom that likes to keep some of my sanity. So when birthdays and Christmas roll around, we tend to get a lot of presents from family and friends, for which I’m truly grateful. BUTTT we just don’t need that many things, or the clothes won’t fit, or we will already have that toy, etc. We return these extra items we don’t need and get a gift card. Then we use this gift card to purchase presents for our kids (or everyday essentials like diapers). We still use these cards on the kids, so the money is not being used on things beyond their intended purpose… And I don’t feel guilty. We do quite a bit of shopping at Kohl’s (many times their prices are comparable to or even better than Amazon’s) and we love their Kohl’s Cash program. Last year, both our parents decided to go in and buy us a Bob double stroller (although I wish we would’ve gotten a single Bob with August). We purchased it while they were running their Kohl’s Cash promotion, our parents paid us back for it, and in return we got quite a bit of Kohl’s Cash. We then used the Kohl’s cash to buy presents for Christmas, we especially love their kid’s toy section. They have so many great toys- especially those Melissa & Doug toys. They didn’t know we did this either… well, now they do. Love you guys! Thank you for the gift! *You do have to be careful with using Kohl’s cash because it may cause you to spend unnecessary money on stuff you don’t need. Also, it is good to plan in advance. Since Kohl’s Cash happens many times of the year and you can only use it for a short period after you receive it, you should try to plan ahead and find items you can buy now and give as gifts later on. Thanksgiving is a great time to do this because many times, Kohl’s will offer double Kohl’s cash for a limited time. Then you buy the gifts on sale, because hello, it is Christmas and just about everything is on sale, and use the Kohl’s cash so you end up paying nothing… or barely anything. Want even more bang for your buck at Kohl’s? We basically exclusively shop the clearance section for the kids’ clothes and my own clothes. Then, we use Kohl’s Cash to buy it. Sometimes we end up with a cartful of items for next to nothing. It is amazing! Awhile back I scored a shirt, two pairs of pants, two onesies, and a hooded vest for August for $5 using this technique. All the items were on clearance and then we had $15 in Kohl’s cash. So that is it. We return extra gifts and put them on gift cards to use for our kids’ gifts, and we use Kohl’s cash to purchase gifts. Using these tips allows us to spend next to nothing for wonderful and quality gifts. Winning! What do you think? Great ideas or are we totally terrible people? Great ideas. I’m sharing them with quite a few of my friends. No you aren’t terrible your an Ensign. Your ideas and projects you share are fantastic. Keep them comming! These are really wonderful ideas. Definitely going to try them myself. Thank you for sharing!